Before you think I'm an Asian tiger mom in the making (or already am one), I'm not okay! *defensive* Though I must admit that while we try to remain as chill and laid-back as possible, we, as parents tend to get overexcited (or rather, impatient) and wish that our kids can learn things a little faster sometimes. In other words, there's a kiasu side to every parent! I've always thought of myself to be quite a chill mom, but sometimes I still catch myself secretly hoping that Tyler would learn to speak a little faster, recognise more letters in the Alphabets (though he can already pretty much recognise all of them! ), and recite 1-20 without any issue at all (he still can't pronounce the number 7) 😂 I guess in a way, we, parents are all afraid that when our child grows older, they wouldn't be able to catch up in school or be on par with the rest of their peers, seeing that everyone is sending their kids to school much earlier than before, and tuition classes start as early as 5-6 years old!! We want our kids to learn as much as they can in their prime tender years, and there's really nothing wrong with that. Only problem with modern day parents though, is that while trying our best to nurture the minds and intelligence of our children, we tend to forget about their emotional growth, which is as equally as important, if not, more if you asked me. Growing up, I've seen many of my peers who did so well in school. They were always in the first class, top 3 students in school, scholars and first class honours graduates! However, when it comes to their emotional and social side, they struggle. They struggle in making friends in school cos they tend to feel awkward striking conversations, especially with people they're not familiar with. They struggle with understanding how to express themselves in the right ways and getting their messages across to others, which includes using the right words, at the right time. All these and more are categorised under the Emotional Quotient (EQ) of a person, which plays a huge part as to whether you'll do well in life, as much as IQ does. Sure, being smart and intelligent (high IQ) brings you places. But EQ is the thing that keeps you in those high places. Without EQ, many struggle to maintain their success because of their behaviours and pardon me for the lack of better words- lack of common sense. After seeing so many instances around me, I'd have to admit that personally, I feel EQ is more important than IQ, especially so in today's modern society where certifications don't count as much as before any longer. Which is why as much as we want to ensure that Tyler is learning well academically (which are A-Z's and 1-10 for now lol), Boon and I agree that we want to make sure that he is good with people, good with expressing himself, with carrying himself in the right manner, and other EQ-related attributes. In fact, whenever we hang out with other parents, we would often chat about our kids and agree that their EQ is something that we should pay attention to cos in this day and age, the future is very unpredictable. Things happen and change so fast, so the ability to be flexible and adaptive mentally and emotional is very important indeed. For this reason, I have been looking for something that aids in emotional development too. 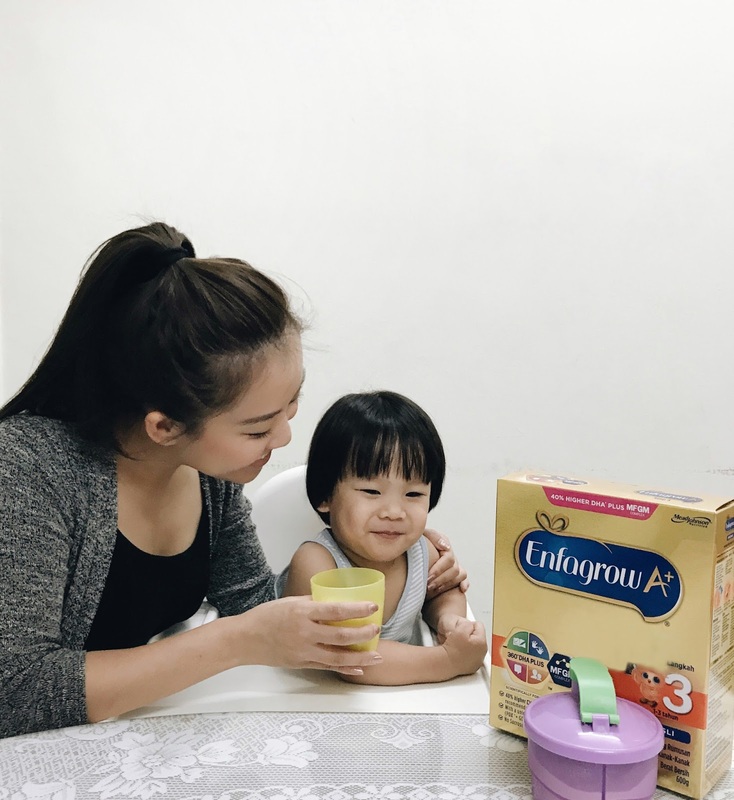 I was delighted when I found out that Enfagrow A+ has recently launched a new milk formula which contains the highest level of DHA with the benefits well established to support brain development (IQ), which also contains MFGM Complex, a new breakthrough in paediatric nutrition. MFGM is short for Milk Fat Globule Membrane, which is a natural source of phospholipids and sphingomyelin (which are found abundantly in the brain), and this nutrient has been shown to support EQ development. Which means, MFGM works together with DHA to support both IQ and EQ! When I read up more, I understood that it is a lipid complex made up of several beneficial bioactive components including complex polar lipids, which play an important part in development and building immunity. What this means is that they work to "pad up" the nerve cells within the brain, helping them to become more stable and transmit information faster. 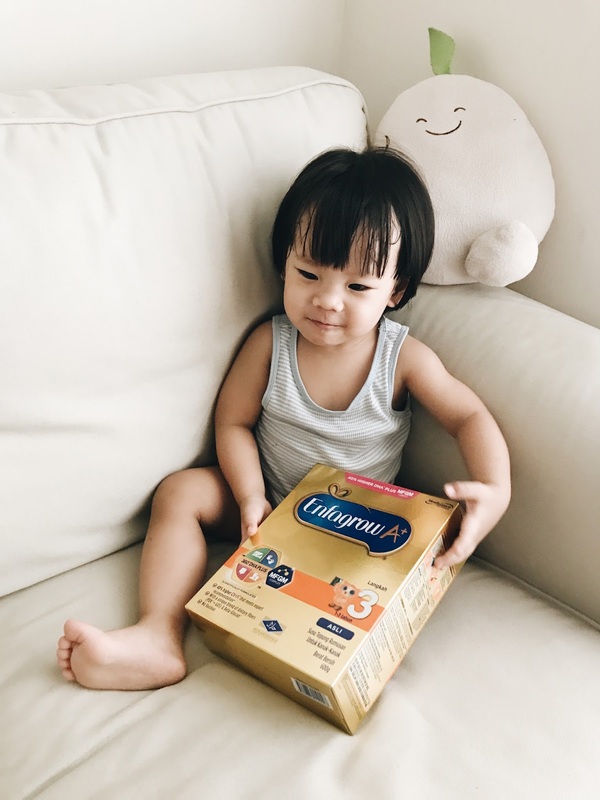 A study found that children who consumed milk enriched with MFGM demonstrated significantly improved scores for emotional and behavioural regulation compared to children receiving the same formula without MFGM enrichments. Which is really interesting cos I never knew that nutrition can help support EQ development! Ooooh is this my new milk, mama? Okay, mama enough of photos. You can go make my milk now. I'm a firm believer what we are in a huge part of what we consume. "You are what you eat", remember? 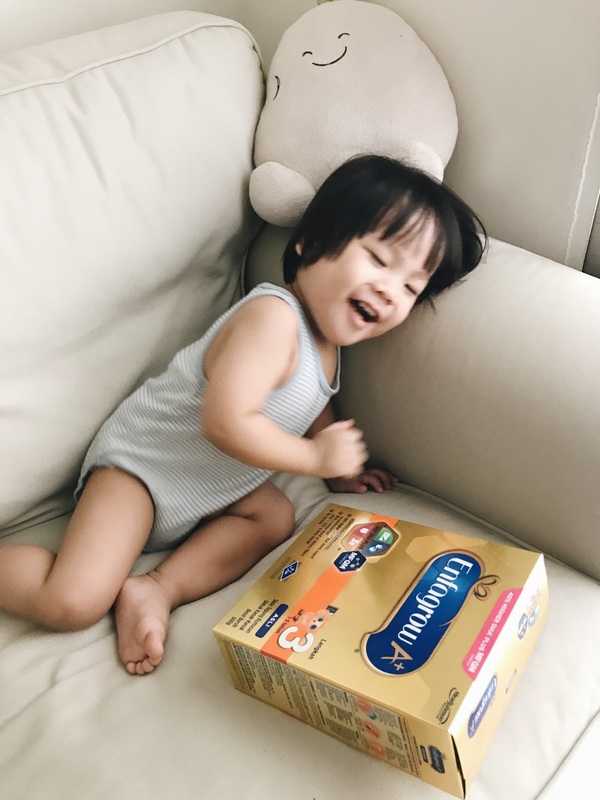 Hence feeding our children with the right source of nutrients would help them develop more than just physically, but mentally and emotionally too, especially in the first 5 years of their lives because that is where 90% of the brain development occurs! This fact always intrigues me: Did you know that the brain almost triples in size within the first two years of a child's life, reaching approximately 80-90% of adult weight? During this time, the brain undergoes rapid development, building the foundation for cognitive and emotional advancement that will carry on into adulthood! These are critical years which is why we shouldn't underestimate what we feed our children in the early years- lots of fruits and veg included!